Broccoli! I have professed my love for raisins many times, but you may not know that I also love broccoli. I love it so much that if the house was on fire, it’s quite possible that I would pull the broccoli out of the fridge on the way out! After getting off to a great start with the French Fridays with Dorie group last October, I took a very long break. Broccoli brought me back. 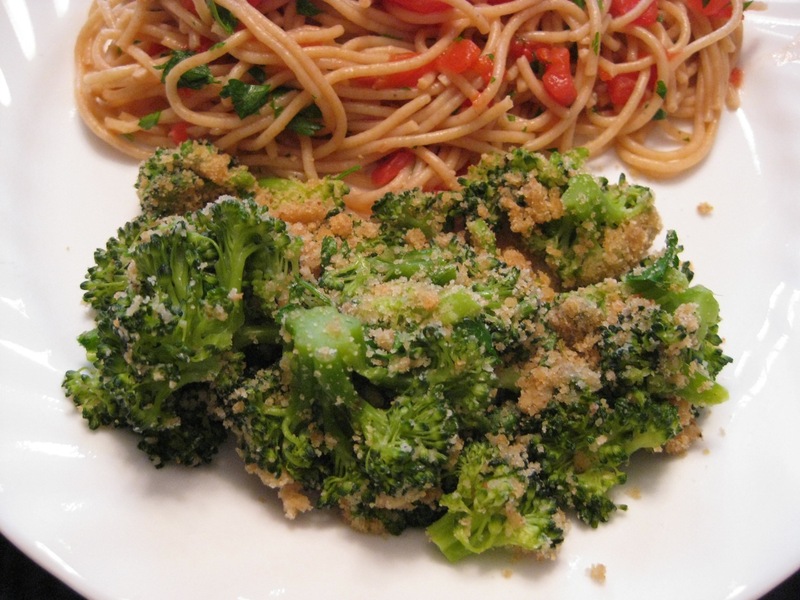 Butter, garlic, and bread crumbs are toasted, a little parsley is tossed in and then steamed broccoli joins the party. Lemon zest is added to the mix if you’re so inclined (but I wasn’t). I usually eat broccoli with a little butter and seasoned salt, so this was an extra-special side dish. I laughed when I read the comments about this recipe; some FFwD members were talking about how hard it was to style the broccoli for a photo. I tossed it on my plate and snapped a couple of shots. Even unstyled broccoli is beautiful! The French Fridays with Dorie group is not publishing recipes. We all have a copy of Around My French Table by Dorie Greenspan and you should too! Open your copy to page 334 for this recipe. Here’s a link to a nice article that Dorie wrote about entertaining, French style. And a link to a nice review of Around My French Table on the Weight Watchers site, including a couple of recipes from the book. Your broccoli looks wonderful! What a great side to go with spaghetti! Just like you, I tossed the broccoli on a plate, snapped it, and that was it! I used to hate begging as a kid (ie I refused to try it), but it is now one of my favorite veggies. Smarty pants iPhone subbed “begging” for “broccoli” – sorry. Okay, I wasn’t going to make this one because we all love broccoli, as in we eat it maybe 4 times a week love broccoli, and with that sort of track record, steamed broccoli only, I really really hate to mess with it. Why ruin a perfectly good, low calorie, easy, delicious thing with something there is a chance that someone might like better and request all the time? Hmmmm…everyone who has made it seems to be enjoying it…now I have to decide if that is a good thing or a bad thing. Yours looks delicious and very photogenic! No lemon, really??? You know I am going to add that when I make it, right? Nice one, Jill. Broccoli is such a great vegetable (my husband’s favourite) and I make it all the time. I agree that it’s also very photogenic.. there are just so m any nice curves to it! Wow, you really really love broccoli! I like it but it’s not a top 3 veggie at our house. This recipe does sound really delicious, I’ve got to break out my copy of AMFT and try it soon. I was one who just snapped a quick photo and dug in! Thanks for sharing the weight watchers link about Dorie. I’m going to hang on to it and try their version of the curried chicken when we do that one. The pasta you served it with looks good too. Give the zest a chance the next time, if anything, just for the smell while it warms up with the butter and garlic. OK, I like broccoli but I can’t say that broccoli is definitively better than gummi bears. I was chuckling because folks usually complain about broccoli. I considered it a victory that my family ate it so much though I think it safe to say we would not save it in case of emergency. Chocolate, some cheeses, Apple Pie from Mystic Pie of Vermont……but if I were to go nutty over any particular broccoli dish, this would surely be it. Nana’s house loved it as well and our families will be repeating this one many times over. I didn’t even use a photo of it on the plate. I didn’t want it to get cold while I was taking a “perfect” picture. Everything we were having that in that meal was best when served hot, so we just got right to eating. I love the idea of serving broccoli as a side for spaghetti. I usually put the veggies in the pasta. I love broccoli too, and this looks like a must-make recipe!